Rawls agreed to a contract Wednesday with the Jaguars, Ian Rapoport of NFL Network reports. Analysis: The 25-year-old suited up for just one game for the Bengals in 2018 but showed some initial promise when he broke into the NFL with the Seahawks in 2015. Injuries have been an issue for Rawls, but assuming he's healthy this offseason and training camp, he'll have an opportunity to carve out a depth role in the Jacksonville backfield. T.J. Yeldon and Corey Grant are both eligible for free agency this offseason. The Bengals waived Rawls on Tuesday. Rawls logged two snaps on special teams during Sunday's 27-17 victory over the Dolphins. Analysis: Rawls, who signed with the Bengals in mid-September, was active for the first time this season to provide depth at running back with Giovani Bernard (knee) sidelined. However, Cincinnati was content with letting Joe Mixon handle the entirety of the rushing workload. While Rawls may stick on the active roster until Bernard returns in the coming weeks, don't expect him to get many, if any, chances on offense as long as Joe Mixon is healthy. Rawls is active for Sunday's Week 5 tilt against the Dolphins, Katherine Terrell of ESPN.com reports. Analysis: The veteran likely will slot in as third in the backfield pecking order behind rookie Mark Walton and returning starter Joe Mixon (knee). If he sees any action Sunday, it would mark Rawls' first snaps in Cincinnati since signing on Sept. 19. Given what's expected to be a minimal role at best, he doesn't warrant fantasy consideration. Rawls (coach's decision) is inactive Sunday against the Panthers. Analysis: Rawls missed some practice time this week due to general soreness, but he was back on the practice field both Thursday and Friday. This makes his inactive status a bit surprising, especially with regular starter Joe Mixon (knee) on the shelf. This move will leave Mark Walton as the only remaining healthy running back on the active roster behind presumed starter Giovani Bernard. Rawls (general soreness) was a full participant in Thursday's practice, Paul Dehner Jr. of The Cincinnati Enquirer reports. Analysis: Rawls was limited in his first Bengals practice Wednesday due to general soreness, but he now appears fully healthy. The 25-year-old will serve as Cincinnati's No. 3 running back behind Giovani Bernard and Mark Walton until Joe Mixon (knee) is able to return to the field. Rawls currently holds little fantasy value in what stands to be a minimal offensive role. Head coach Marvin Lewis said Thursday that running backs Giovani Bernard and Mark Walton will "shoulder the load" while Joe Mixon (knee) is sidelined, leaving Rawls as the clear No. 3 running back, Ross Tucker of SiriusXM NFL Radio reports. Analysis: Rawls was signed this week to help bolster the Bengals' backfield depth with Mixon (knee) out multiple weeks. However, it doesn't appear that Rawls will get much work in his absence, as Cincinnati appears set on using the guys that have been with the team and working in their system. Rawls will only have fantasy relevance should either Bernard or Walton suffer an injury themselves. Rawls didn't practice in full Wednesday after experiencing cramps, Geoff Hobson of the Bengals' official site reports. Rawls signed a contract with the Bengals on Wednesday. The Jets released Rawls on Saturday, Manish Mehta of the New York Daily News reports. Analysis: Rawls has some name recognition thanks to his productive rookie season with Seattle in 2015, but he was never a good bet to stick around on the 53-man roster in New York, where the recent signing of Charcandrick West essentially sealed Rawls' fate. The 25-year-old will have a tough time finding work this season. Rawls rushed eight times for 12 yards and caught two of three targets for 10 more in Thursday's 15-13 preseason loss to Washington. Analysis: Rawls had been battling an undisclosed injury, so it was nice to finally see him on the field. The 25-year-old running back averaged just 2.7 yards per carry with Seattle last season, so he's going to have to show a bit more explosiveness if he wants to make the cut in New York. While that burst wasn't evident Thursday, Rawls will presumably have two more exhibitions to make his case. Rawkls (undisclosed) could see a decent amount of snaps in Thursday's preseason game against Washington, NJ.com reports. Analysis: Eric Allen of the Jets' official site relays that Rawls worked in team drills this week after not playing in the team's preseason opener. With Isaiah Crowell (concussion) and Elijah McGuire (foot) out, Rawls and George Atkinson could see their share of snaps Thursday night, especially if the team decides to cap the workload of holdover Bilal Powell. Rawls (undisclosed) did not practice Tuesday and will not play in the Jets' preseason opener Friday against the Falcons, Manish Mehta of the New York Daily News reports. Analysis: Rawls entered training camp expected to be on the bubble for a 53-man roster spot and has already added another issue to the laundry list that is his injury history. He last produced in a significant capacity during his 2015 rookie campaign and sits in a precarious position as training camp continues on. Rawls will likely need to return sooner rather than later if he has any hopes of breaking camp with the team. Rawls will enter training camp on the roster bubble, NJ.com's Daryl Slater reports. Rawls signed with the Jets on Friday. Analysis: Rawls burst onto the scene as an undrafted rookie in 2015, taking 147 carries for 830 yards (5.6 average) and four touchdowns in 13 games for the Seahawks. He suffered a major ankle injury late in the year and hasn't looked the same ever since, managing just 506 yards and three scores on 167 carries (3.0 YPC) the past two seasons. Rawls likely will need to compete for a roster spot behind Isaiah Crowell and BIlal Powell in New York. Rawls is slated to visit the Jets on Thursday, the New York Daily News reports. Analysis: The 24-year-old logged 157 rushing yards on 58 carries in 12 games for the Seahawks last season, a far cry from the 5.6 yards per carry effort he turned in (on 147 attempts) as a rookie in 2015. If Rawls joins the Jets backfield, he'd profile as a depth option, with Isaiah Crowell, Bilal Powell and Elijah McGuire already in the mix. Rawls has a visit with the Jets planned for Thursday, Brian Costello of the New York Post reports. Rawls didn't receiver a tender from the Seahawks, Gregg Bell of The Tacoma News Tribune reports. Analysis: Rawls becomes an unrestricted free agent and likely will have to settle for a shot to compete for a roster spot. 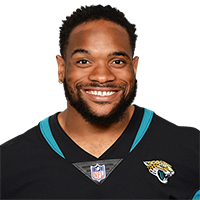 He burst onto the scene with 830 rushing yards on 147 carries (5.6 average) as an undrafted rookie in 2015, but he was utterly ineffective (3.0 YPC on 167 totes) the past two seasons, never regaining his pre-injury form. The Seahawks also non-tendered Mike Davis, leaving only Chris Carson (ankle/leg), C.J. Prosise (ankle) and J.D. McKissic in the backfield. Rawls had a miserable season, averaging 2.71 yards per carry, third lowest in the league among backs with at least 50 rushes. Rawls is active for Sunday's game against the Cowboys, the Seattle Times reports. Analysis: Rawls was inactive last weekend against the Rams, but he's back in uniform in Week 16 to serve as the Seahawks' No. 3 running back behind Mike Davis and J.D. McKissic. Meanwhile, the team made veteran Eddie Lacy a healthy scratch Sunday. Rawls (coach's decision) is listed as inactive Sunday versus the Rams. Analysis: Mike Davis has taken a hold of the backfield, and with a banged-up defense, the Seahawks will only have two other running backs active in J.D. McKissic and Eddie Lacy. As a result, Rawls will take a seat for the fourth time this season. Rawls ran for four yards on his lone carry during Seattle's 24-10 win over Philadelphia. Analysis: Rawls saw just three offensive snaps on Sunday, and his carry didn't come until Seattle was nursing a two-score lead late in the third quarter. Rawls was a revelation when be broke out onto the scene in 2015, but injuries derailed 2016 and he's been lost in the shuffle this year. He has just two out of nine games with more than 50 total yards and has yet to score this season. With Seattle seemingly turning to Mike Davis, keep Rawls off your roster. Rawls only played one snap on offense in Sunday's 24-13 win over the 49ers, Bob Condotta of The Seattle Times reports. Analysis: Seahawks coach Pete Carroll said Rawls would re-enter the running-back rotation with Mike Davis (groin) unavailable. 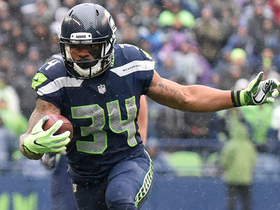 Rawls avoided the inactive list, but he didn't have a meaningful role and could soon find himself back in street clothes with Davis having a shot to return for Week 13 against the Eagles. Eddie Lacy and J.D. McKissic handled the backfield work in San Francisco. Seahawks head coach Pete Carroll said Tuesday that Rawls would reenter the team's running-back rotation for the Week 12 matchup with the 49ers, Bob Condotta of The Seattle Times reports. Rawls (coach's decision) is listed as inactive Monday against the Falcons. Analysis: Over the last five games, Rawls received between 29 and 42 offensive snaps. The modest usage didn't translate to the box score, though, as he averaged 2.8 YPC on his 44 rushes and reeled in seven of 10 passes for 74 yards. With Rawls in street clothes, the Seahawks will turn to the trio of Eddie Lacy, J.D. McKissic and Mike Davis out of the backfield. 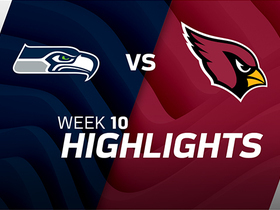 Rawls rushed 10 times for 27 yards and brought in both of his targets for 12 yards in Thursday's 22-16 win over the Cardinals. Seahawks offensive coordinator said Rawls will lead the Seattle backfield in Thursday's game against the Cardinals, ESPN.com's Brady Henderson reports. Rawls is on pace for lead-back duty Thursday in Arizona due to Eddie Lacy's strained groin, Gregg Bell of The Tacoma News Tribune reports. 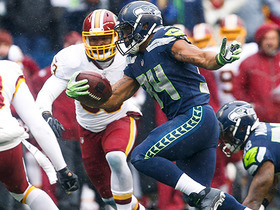 Rawls rushed nine times for 39 yards and tacked on 31 more with two receptions in Seattle's 17-14 loss to the Redskins on Sunday. Analysis: Rawls took over as the Seahawks' lead back after Eddie Lacy departed in the second quarter with a groin injury. 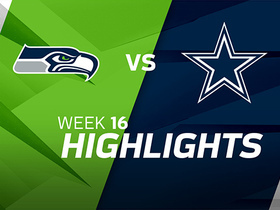 Neither was the team's leading rusher however, as Russell Wilson outpaced them both with 77 yards on the ground. The severity of Lacy's injury will likely have a large impact on Rawls' workload in Week 10 at Arizona, as the former Packer had been tabbed as the feature back coming into this week's contest. 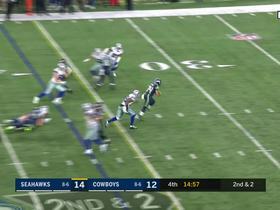 Seattle Seahawks running back Thomas Rawls rushes for 15 yards. Seattle Seahawks running back Thomas Rawls sprints up the field for a 23-yard gain, his longest run this season. Seattle Seahawks quarterback Russell Wilson dumps off a pass to running back Thomas Rawls for a 22-yard gain. 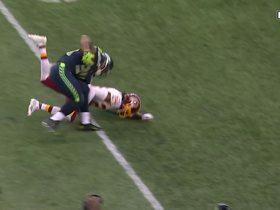 Seattle Seahawks running back Thomas Rawls stiff arms Washington Redskins cornerback Josh Norman to the ground for no gain. 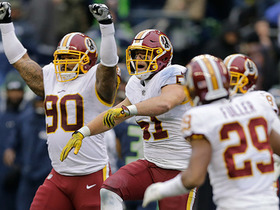 Washington Redskins linebacker Will Compton intercepts Seattle Seahawks quarterback Russell Wilson in the middle of the field. 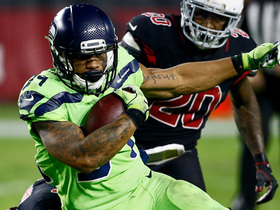 Seattle Seahawks running back Thomas Rawls bursts through the middle for a first down and gain of 11 yards. 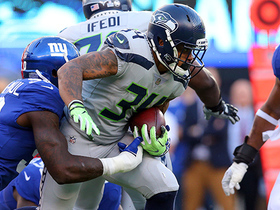 Seattle Seahawks running back Thomas Rawls takes on New York Giants defenders after short pass from QB Russell Wilson. 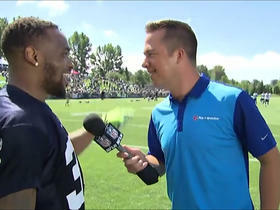 Seattle Seahawks running back Thomas Rawls jokes with NFL Media's James Palmer at training camp.